But I don’t just have these for work. These Roasted Vegetable Pita Pockets with Basil Pesto have been going on my dinner meal plan at least once a week recently. And they are sooo good! But alas, as it is so often the way, they are not a hit with all of us. 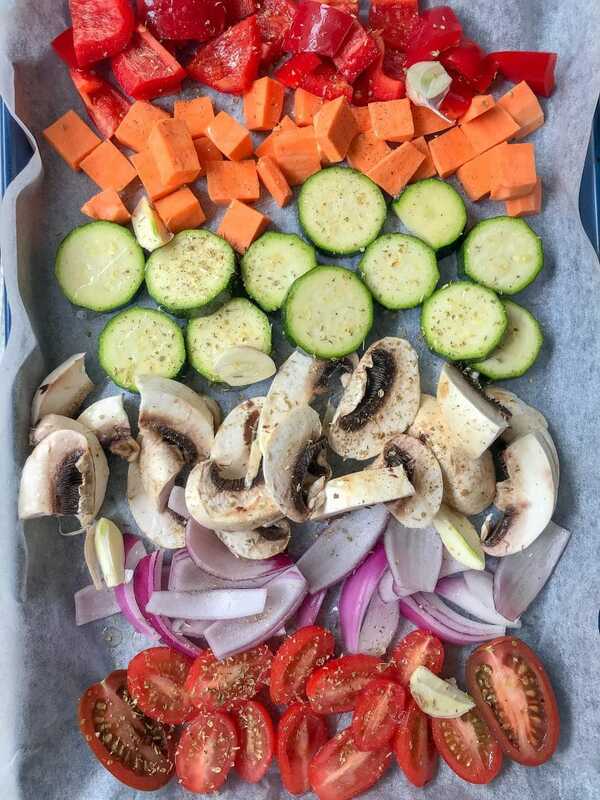 Mr 7 is not a big fan of roasted vegetables, so when I serve this meal I normally serve the roasted vegetables on the side and he has salad and ham pita pockets. 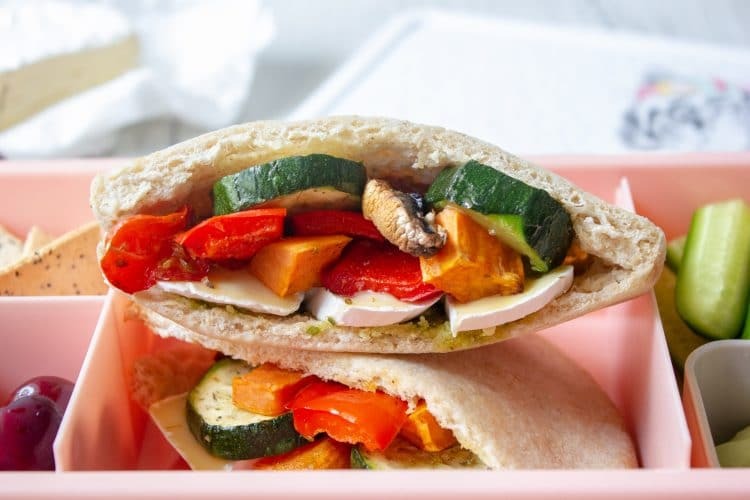 These Roasted Vegetable Pita Pockets with Basil Pesto can be adapted to whatever vegetables you have left in the fridge and pantry, and it’s easy just to add more vegetables if you need more for your family! Though I love to use a range of colours to give this dish vibrancy. 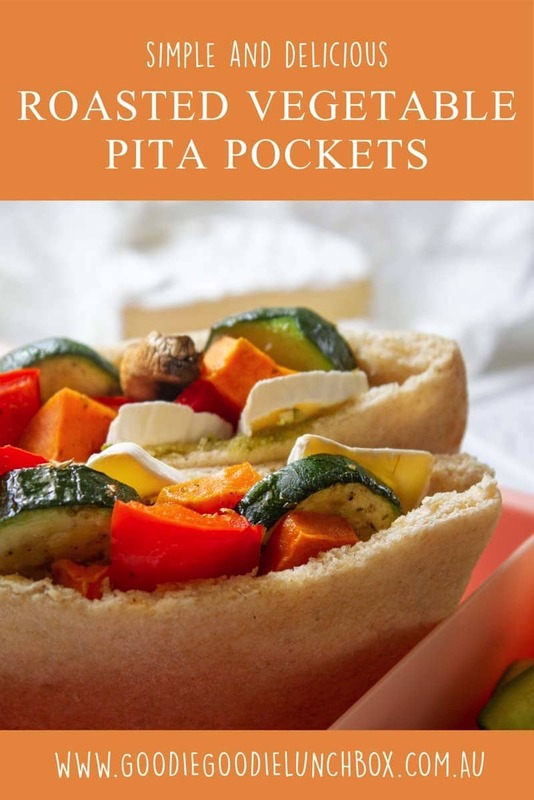 I love to add Brie to my pita pockets but you could easily add a different cheese too – Feta would work brilliantly. If you were thinking about taking this to school you may need to find a nut free basil pesto if your school is nut free. If you are looking for other recipes that are fantastic for work lunches why not try my delicious Roasted Pumpkin and Feta Muffins our my Zucchini Pea and Ricotta Slice. 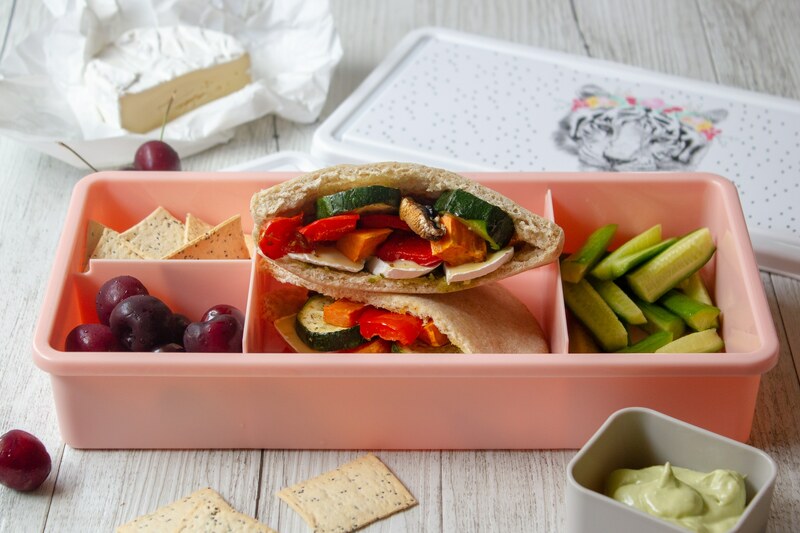 These delicious and adaptable Roasted Vegetable Pita Pockets with Basil Pesto are great for dinner or work lunches. Roast for 15-20 minutes until cooked through. Meanwhile, prepare the pita pockets as per the instructions and spread with pesto and add a slice or two of brie to each pocket. Once the vegetables are ready, cool slightly then add to a prepared pita pocket. You may wish to remove the garlic and discard the peel and eat the garlic or you may wish to discard. This recipe is really adaptable. I have served the vegetables as a side dish. Another option is to stir through rissoni. 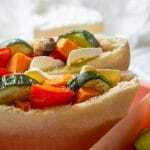 I hope your family love these Roasted Vegetable Pita Pockets with Basil Pesto. This is a delicious, simple dinner or lunch. Remember if you make this recipe come share with me on Instagram or Facebook.